Stand out from the crowd with this beautiful Clogau Tree of Life Pendant Necklace, boasting a modern and elegant design. A beautiful classic 9ct Yellow and rare Welsh 9ct Rose Gold Pendant suspended on a 22" Gold curb chain necklace, this Clogau Gold Necklace is the perfect addition to any fine jewellery collection. The Clogau Tree of Life Necklace embraces the demands of modern jewellery and combines this with elegant style. This stunning Clogau 9ct Gold Tree of Life Necklace features a delicate mix of entwined berries, leaves and vines. Brought to life in these two beautiful Gold tones, referring to new life evolving from the old. Adding a touch of modern style to any outfit, inspired by Welsh themes & romantic stories this Clogau Pendant makes an ideal gift choice. The delicate design of the Clogau Sliver & 9ct Gold Pendant Necklace can easily be teamed up with other pieces from the Clogau Jewellery Collection, suitable for all occasions. 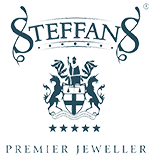 Then why not call a member of our team on 01604 622090 or e-mail online@steffans.co.uk and we will be more than happy to answer any questions.